Who are Haroot and Maroot? They are the two angels that Allah mentions in the Quran. He sent them to Babylon where the devils taught black magic to people. The two angels showed them even more powerful magic with warning that the magic is only a trial. They are sent down to test human with human and thus separate who believers and who are the disbelievers. The current media be it movie and books glamourise magic tremendously. To learn “white magic” is perhaps the coolest thing in the world. Harry Potter and friends are good group of young people who are fighting evil. “white magic” is good and “Black magic” is voldermort, bad and evil and cannot be named. The truth is all magic are evil. And magic is disbelieve! That is why Allah said prophet Sulaiman alaihi salam did not disbelieve in this ayah. If you look around when people talk about magic, you can trace that supposedly magic goes all the way to Prophet Sulaiman alaihi salam. And this is false. And Allah has confirmed that this is false! And we believe in Allah than some people who are trying to glamourise magic and raise the status of shaytan! Allah has given prophet Sulaiman the miracle (mu’jizat) to be able to control the jinn, animals and wind. He was very much against magic and had confiscated the book of magic and kufr that some people were practising with teh aid of Shytan. He hid it under his throne. After his death and after the death of the righteous who knew, shaytan showed the human the books of magic under Prophet Sulaiman’s throne and accused Prophet Sulaiman of practicing magic and that was why Prophet Sulaiman could have the power that he had. And after that magic spread again under the lie that it originated from Prophet Sulayman. Among the plots of shaytan is to separate the husband and wife and they will try their utmost best to do it. 1. Haroot and Maroot are angels sent down to Babyln to test human with magic. 2. Learning magic is disbelieve. 3. protect yourself by getting closer to Allah. 4. Do your morning and evening adzkar. 5. 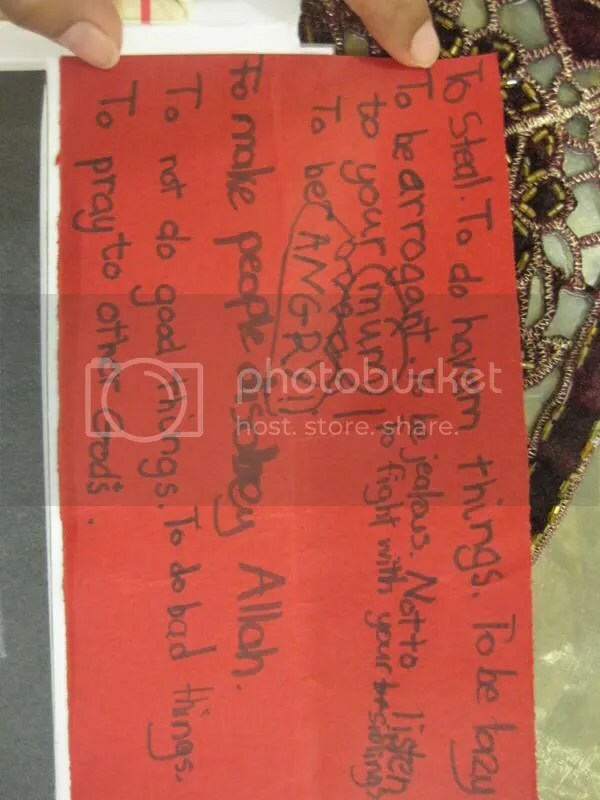 Prophet Sulaiman alaihi salam did not practise magic. 6. media is trying hard to glamourise magic. 7. There is no such thing as white magic. 8. White magic and black magic are equally evil. 9. Do you think Harry Potter and friends are good? Beforehand, the devils used to ascend to heaven and eavesdrop on the conversations of the angels about what will occur on the earth regarding death, other incidents or unseen matters. They would convey this news to the soothsayers, and the soothsayers would in turn convey the news to the people. The people would believe what the soothsayers told them as being true. When the soothsayers trusted the devils, the devils started to lie to them and added other words to the true news that they heard, to the extent of adding seventy false words to each true word. The people recorded these words in some books. (Sulayman did not disbelieve, but the Shayatin (devils) disbelieved). There were different opinions about Harut and Marut whether they are angels or they are men. Whether they did teach magic or otherwise. Many among the Salaf, said that Harut and Marut were angels who came down from heaven to earth and did what they did as the Ayah stated. To conform this opinion with the fact that the angels are immune from error, we say that Allah had eternal knowledge what these angels would do, just as He had eternal knowledge that Iblis would do as he did. This Hadith has an authentic chain of narration and there are other Hadiths which support it. Separation between a man and his wife occurs here because each spouse imagines that the other spouse is ugly or ill-mannered, etc. Allah’s Messenger (may peace be upon him) as saying: When a person enters his house and mentions the name of Allah at the time of entering it and while eating the food, Satan says (addressing himself: You have no place to spend the night and no evening meal; but when he enters without mentioning the name of Allah, the Satan says: You have found a place to spend the night, and when he does not mention the name of Allah while eating food, he (the Satan) says: You have found a place to spend the night and evening meal. This hadith has been narrated on the authority of Jabir b. Abdullah through the same chain of transmitters but with a slight variation of wording. Alhamdullilah we have been practising this since we learnt this hadith when we studied the manners of eating sometime ago. Read HERE. 2. Enter the house with the right foot. 3. Enter the house gently. 4. Greet our family members with salam as we enter. From this narration, we can conclude that we should say salam as we enter our house and greet our family members. I usually say salam regardless that there is no one in the house anyway. However, in the nrration above it says we should say`As-Salamu `Alayna wa `Ala `Ibad-Allah-is-Salihin (peace be upon us and upon the righteous servants of Allah).’ And the angels will return the greeting. Also read HERE on the related matter. Whenever Allah’s Messenger (may peace be upon him) entered his house, he used tooth-stick first of all. We have never done this sunnah. We will see how best we can do to apply this in our life, Insya Allah. However, if we are not using the tooth stick, we will use the toothbrush minus the toot paste for a change. Summary of Manners of entering our house. 2. Enter with right foot. 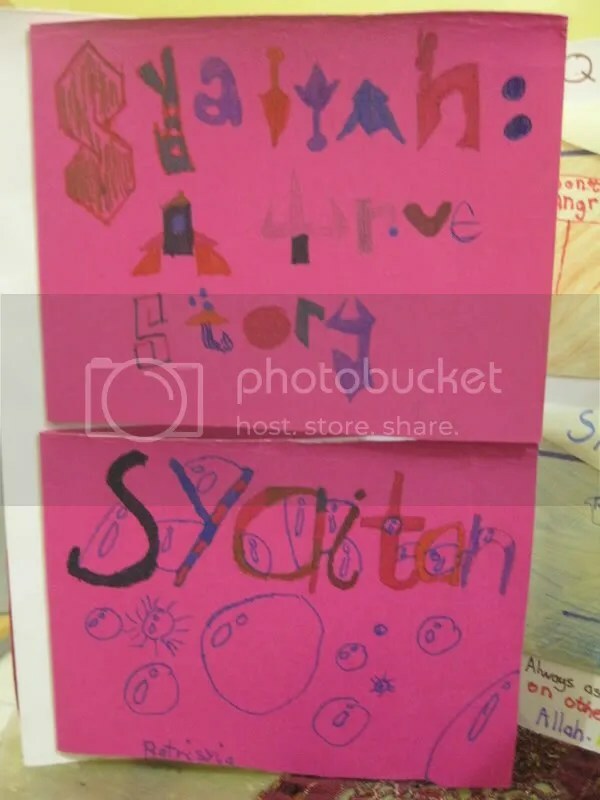 We did a lapbook last school holiday. This sort of summarises what we have learned the last term. To be honest with you, this is coincidental. I didn’t really plan the syllabus to cover so much lessons on the shaytan (because I am still not good at that bigger planning for the syllabus. But it does give an idea of sort). 2. Lessons to be learnt from knowing the story of Prophet Adam a.s. So this lapbook became a good conclusion of this term’s lesson. It help them to refresh what they did. Insya Allah. We used mostly paper bags that we get when we purchased things from the store for the cover page. 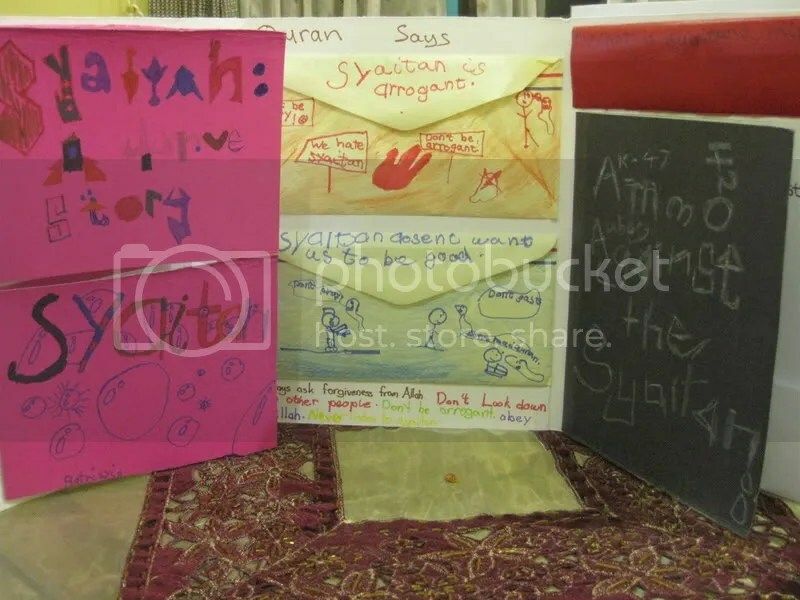 On the most left is a flip book which has Haziq’s and Sya’s version of the story of Shaytan. A long time ago, there were planets and jannah and hell and lots of animals. Inside jannah there are angels. Allah told one good jin to go to Jannah. They lived and prayed to Allah. One day a man called Adam was created. Allah told the angels and iblis to bow down. The angels bowed but Iblis did not. Allah asked, why didn’t you bow down? Because he is made of clay and I am made of fire! Iblis got kicked out of jannah. Iblis asked if he could live longer. Allah said yes. Iblis wants to disturb us and make us forget Allah. 2. Shaytan doesn’t want us to be good. 11. It is We who created you and gave you shape; then we bade the angels to bow down to Adam and they bowed down; not so Iblis; he refused to be among those who bow down. Then we remind each other to always ask for Allah’s forgiveness. To not be arrogant. To obey Allah. And to not listen to the temptation of shaytan. On the third page we put up two flip books. 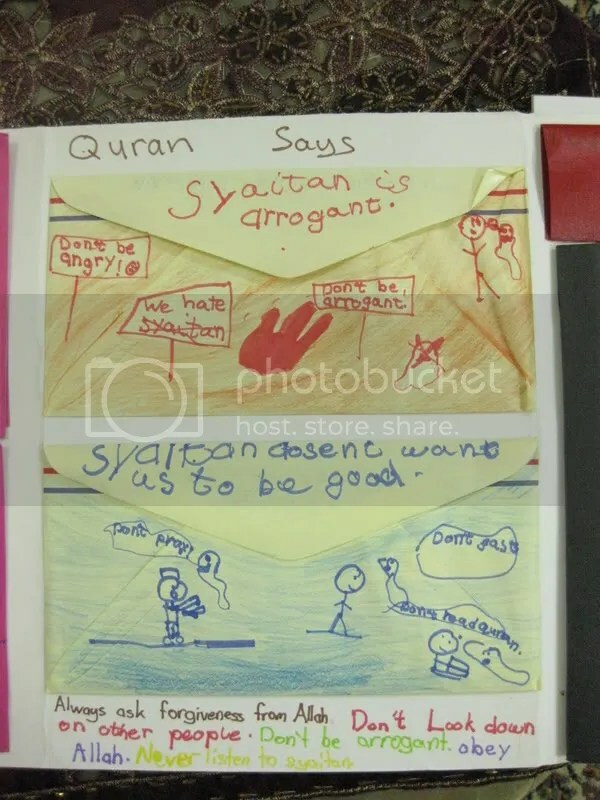 The top one says “What is shaytan’s mission?” I was really expecting one answer i.e. to stray from Allah’s path. But the kids gave me so many version which I accepted all of them. 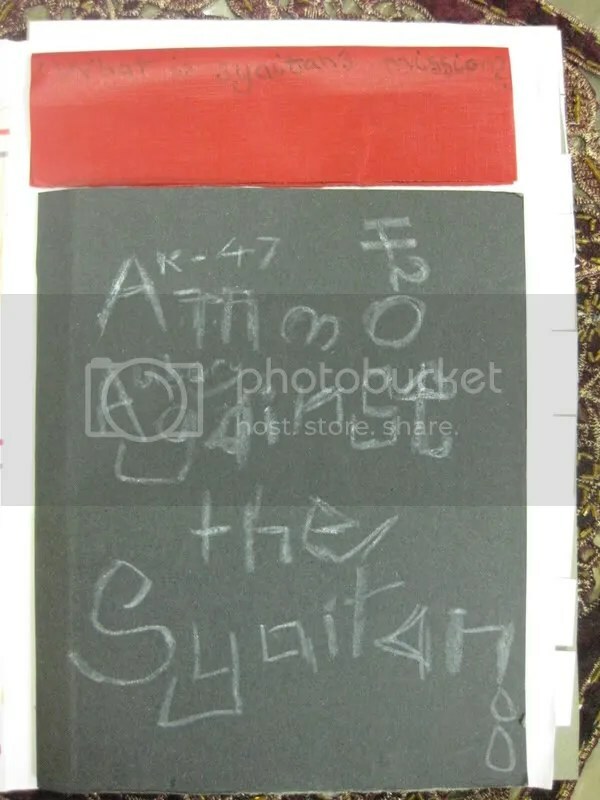 The black book is a summary of the possible ammunition that we can use in our struggle against shaytan. On the last page, we put suratul Falaq and surah annas. 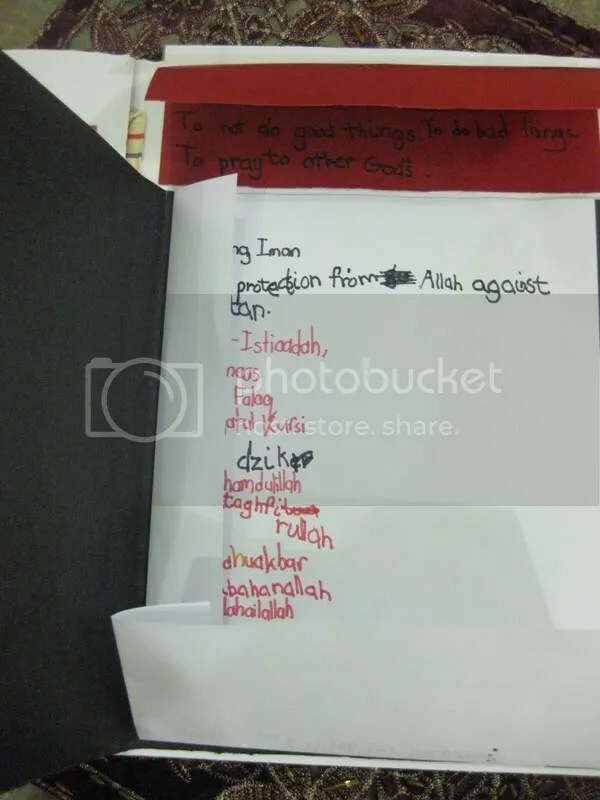 The two surahs that are recommended to be read by all of us as a protection against evil, Insya Allah. With that, I pray that my children will always be in the Straight Path and will be strong in their deen. 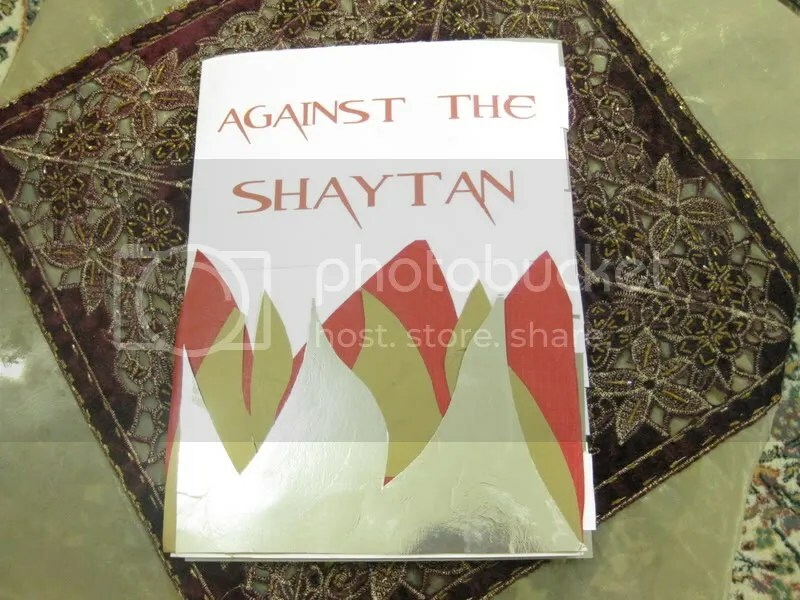 May we all be protected against the fitna of shaytan. 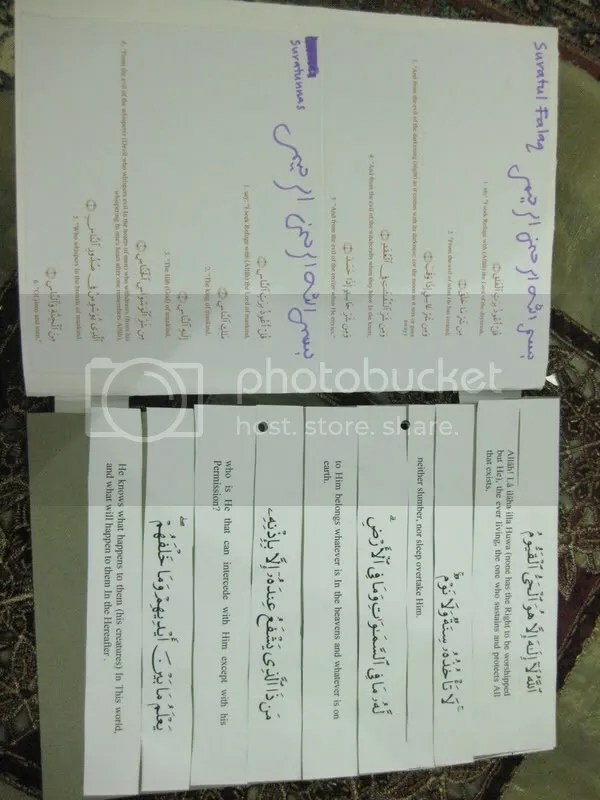 This Ayah refers to the names of in-animate bodies, animals, plants, angels, and means of technology…etc, for example, the sea contains fish and the fishnet should be thrown in the sea in a certain way to catch fish. Then, you should rub two stones together to produce fire, so that you can grill fish and eat it. This seed is called ‘wheat.’ You can plant it in the soil until the rain falls and the seed grows to be a plant. Adam (AS) was not just a pious man; he was also knowledgeable in the matters of the universe. Allah (SWT) taught him the names because He destined him to be a vicegerent on earth. Accordingly, he should be experienced in earthly matters. How could he be a vicegerent on earth if he was a failure? In Surat Al-A’râf (the Heights) verse 19, Allah says what can be translated as, “And O Adam! Dwell you and your wife in Paradise, and eat thereof as you both wish, but approach not this tree otherwise you both will be of the Zâlimûn (unjust and wrong-doers).” (TMQ, 7:19). Then Satan whispered to them that he might manifest unto them that which was hidden from them of their shame, and he said: Your Lord forbade you from this tree only lest ye should become angels or become of the immortals.<(TMQ, 7:20). H was excited reading this ayah. Somehow he noticed this verse in the nasheed “If you ask me by Yusuf Islam.”. 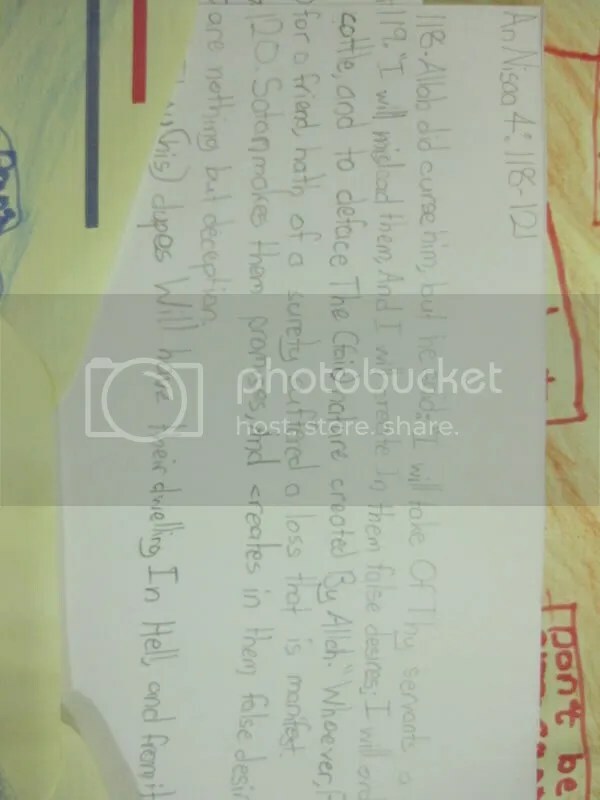 So I have printed this out and he has memorised it. It’s a wonderful doa for all of us. And then we watched a video of Yusuf Estes narrating the story of Prophet Adam in the Peace TV series. Somegow I can’t put it up here for some reason. But you can go and watch it HERE.